If you've ever secretly imagined that you were a pirate while tracing your metal detector across the sand at the beach, or pretended that life and death were in the balance while you eagerly went diving for bright, neon rings at the bottom of your neighborhood swimming pool, then we've got a new game for you: geocaching! 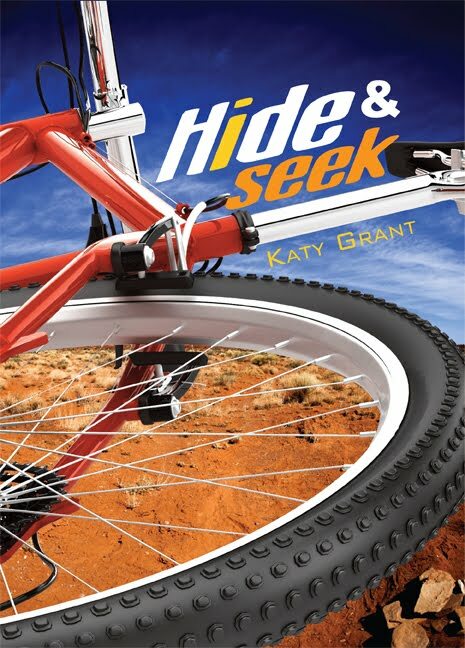 Here to tell you more about the writing process and this treasure hunting game at the center of her new book, Hide and Seek, is Peachtree Publishers' author, Katy Grant. Be sure to read to the end to find out how to win a signed copy of her new book! 1. How did you get the idea for Hide and Seek? What made you want to write this book? Two things, really. Ever since my family and I had tried geocaching, I kept thinking it would make a great backdrop for an adolescent novel. You’re outdoors, using a GPS, looking for “hidden treasure” that no one else knows about. That was the first inspiration. The second was when my family and I spent a long weekend in the White Mountains of Arizona. We did a few geocaches, one quite late in the afternoon in a remote area. I realized we hadn’t brought along flashlights. We were concerned about being out in the wilderness after dark, but fortunately we made it back to our car without incident. That weekend we saw elk, deer, and Canada geese. We also took along Dexter, our German shepherd, and even though he’s a city dog, he LOVED every minute of that weekend, except for when he got a fishing hook stuck between the pads of his paw. I came home and could not stop thinking about writing a novel featuring geocaching. But it’s such a benign activity. There’s no danger involved, just fun, so what would the conflict be? Then I got the idea that the protagonist would find mysterious messages in the cache. And it just started falling into place. Quite a few events from that weekend made their way into the novel. 2. Do you have a writing system or routine to help you focus on your writing? I think a lot of writers have a routine, and we tend to be rather fussy about it to the point that it is almost a ritual. I like to do my initial note taking, outlining, and early drafting in longhand. I have a certain type of legal pad with a spiral binding that I like, and my pens are a certain brand, and they must be black ink. Then I start basically journaling, writing notes to myself: “I have an idea for a book about geocaching. I think the protagonist is a boy about 13 or 14. Don’t know his name yet but . . . .” And I just write everything I know at that point about the idea. Lots of times in the beginning, there’s a flood of ideas, and it’s very exciting and invigorating—like having a good workout when you haven’t exercised in a while. By the time I’m ready to begin actually writing a chapter, I usually switch to the computer and start composing there. But whenever I get stuck or blocked, I’ll go back to the legal pad and just talk myself through it on paper. This particular novel came quite easily for me. I think I began writing in September and I had a complete draft by December. 3. A lot of the readers of our blog are interested in the process that goes into editing a book. Can you explain a little about what the editor/author relationship is like and your editorial process? The editor/author relationship is very collaborative. Both the editor and the author have a vision for the book that this manuscript could evolve into, and ideally they will have similar visions. By the time I reach the editing stage, I am lazy. In my mind, the book is “finished,” because it’s a complete draft. Oftentimes, I don’t want to make any changes. It’s the editor’s job to remind the author that the manuscript just isn’t there yet in terms of being a finished novel. Fortunately, for this manuscript, two years had elapsed from the time I had finished it and the time we began the editing process. So I was able to see with fresh eyes things that I wanted changed, and Kathy Landwehr, my editor liked those changes. There is a lot of back and forth exchange during the editorial process; I’ll bring up questions or insecurities I had about the manuscript, and she will let me know her favorite scenes or least favorite, etc. It’s a time of great feedback and discussion about the manuscript. One thing that Kathy wanted me to work on was the weak ending. I agreed, but I wasn’t sure what to do about it. One of the copy editors made a suggestion that I had never considered, and initially, I didn’t think I wanted to go in that direction. But I tried her suggestion, and it worked wonderfully. It occurred to me that I probably would not have thought of that ending without that editorial guidance. So truly a collaborative experience. 4. What was the most challenging part of the book to write? What was the easiest? The most challenging aspect was trying to capture a believable 14-year-old boy voice. Even though I have two teenage sons, it was difficult for me to breathe life into Chase and make him sound like a real adolescent male. That was tough. The easiest part was writing the last 60 pages or so. I reached a point where the action was so fast that the chapters just poured out of me. That certainly doesn’t happen with every novel, but it did with this one, and it was wonderful. My fingers could hardly type fast enough as I wrote the final action-packed chapters. 5. Geocaching plays an important role in the advancement of the plot. Can you tell us a little bit about what exactly that is and how you got into it? Geocaching is a kind of treasure hunting activity where some people hide caches for others to find later. The cache is a small container with various trinkets inside. There’s also some paper and a pen for logging a record of everyone who has found the cache. 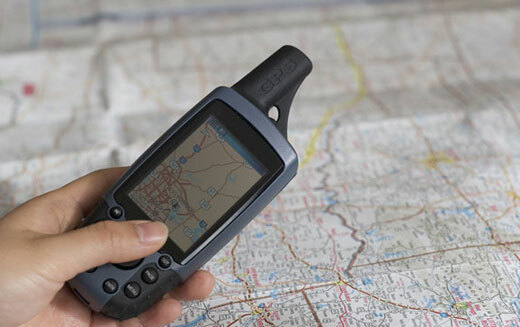 The person who hides the cache marks the location with a GPS and then enters the coordinates on a geocaching website. Sometimes he or she will leave clues, riddles, or verses on the website to make things interesting for the prospective treasure hunters. If you want to find geocaches in your area, you first log onto a geocaching website and enter your location (that is, your coordinates from your GPS) to get a list of nearby caches. Once you’ve enter the coordinates of nearby caches, you’re ready to start your search. Caches can be anywhere—in busy cities with crowds of people nearby or out on a remote hiking trail. When you’re searching, you try to be a little secretive. Non-geocachers are called “muggles,” and if you’ve hidden a cache, you don’t want muggles to accidentally find it, and if you’re searching, you don’t want muggles to know what you’re up to. 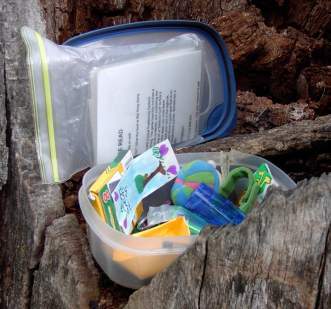 Once you find a cache, you can take one or two of the items inside, as long as you leave something in exchange. My brother introduced my family to geocaching when my boys were young. 6. What is the coolest thing you ever found while geocaching? What do you think the best thing you have left is? We have found a few micro caches—very small containers that don’t contain any items for exchange, but they do have a logbook, usually just a piece of paper inside. We once found an Altoids box that had been painted black and had a magnet attached to it hidden under a footbridge. That was a particularly challenging cache to find, so we were really excited when we finally came across it. We have done several caches when we were camping, and when you’re camping out, you invariably forget to bring along something you need. So we have left small pocket knives behind because we figured other campers out geocaching would find those useful. 7. Why do you think geocaching has such a huge following? I think it taps into everyone’s desire to hunt for hidden treasure, even if the treasure is just a small metal box full of trinkets. There’s the challenge of finding the hidden cache, the thrill once you’ve finally discovered it, and then the fun of leaving it in the same place so someone else can find it later. And even though geocachers don’t have actual contact with each other, there’s still a sense of community. You know there are people out there hiding caches and others out there looking for them. 8. While the main character in the book, Chase, uses his GPS to find a geocache, that is really just skimming the surface of what this book is really about. Without giving away too, much, can you explain a little bit about what Chase finds and how it starts his adventure? On his first geocache, Chase finds a cryptic message, WE NE, written in the logbook. He can’t figure out what it means, and he so he goes back to the cache and leaves a message of his own. Then to his surprise, he finds a response to his message indicating that someone needs food. With the thought that someone is stranded in the wilderness without food, Chase begins his adventure of finding out who needs his help. 9. What inspired the storyline with the missing kids? Did you read a news article, or was it simply out of your imagination? It really just came from my imagination. I came up with the idea of strange messages being left in the geocache logbook, and then I asked myself, who would be leaving messages? Why would they be in the wilderness alone? What would the messages say? And the idea grew from there. 10. What type of research did you have to do for this book? Do you have any advice for other writers about the research that goes into a book? 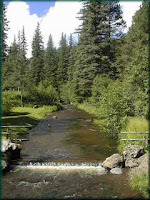 I researched quite a bit about the White Mountains of Arizona and the wildlife of the region. I was pretty meticulous about details; for example, I researched what time the sun sets in early September in Northern Arizona because Chase mentions an exact time at one point, and I found a chart online that gave me actual sunrise and sunset times for the month of September in that particular county. In the scenes where Chase is in the desert outside of Globe, AZ, I used Google Earth images around that area to get a sense of the terrain. I would tell other writers that each book is different as to the research you’ll need to do. For this book, I was able to do all of the research online, so that made it easy. But for previous books, I have consulted experts in the field and asked them to read sections of the manuscript for accuracy. So your research will vary, depending on your subject matter. But I think all writers want their work to be accurate, and those little details are important, so do whatever research is necessary to ensure that what you’re writing comes across as legitimate. 11. Lastly, what is your favorite kid’s book and why? Oh, no—do I have to pick only one? I was an avid reader growing up, averaging about a book a week. I loved the classics—Charlotte’s Web, Stuart Little, Mary Poppins. I remember reading My Side of the Mountain and thinking I wanted to run away and live in the wilderness, and then reading From the Mixed-up Files of Mrs. Basil E. Frankweiler and deciding I wanted to run away and hide out in a museum. But my absolute favorites to this day would be The Borrowers series by Mary Norton, about tiny people who live hidden in households and borrow items from “human beans” in order to survive. I received that series for my tenth birthday, and three weeks later my mother died. I was reading those books at the time of her death, and while that may sound terribly sad, the books were such a wonderful escape. They got me through those very dark days of my childhood. I still own the same copies of those books, and every now and then I’ll take one off the shelf, open it at random, and start reading. Thanks to Katy for the great interview. This book has been great to read all through the editorial process. And now for a GIVEAWAY! Since the Annual American Library Association Conference is this week, we've decided to give away TEN SIGNED COPIES of Hide and Seek to our blog readers and attendees of ALA. Fill out the form below to enter! Be sure to include your e-mail address at the end of your response!